While the golden years may be the most enjoyable stage of life to live through, they can be a real pain in the keister if you are experiencing dental problems. When you hit the big 6-5 (or older), common problems like root decay, gum disease, and loss of teeth can start to become real and present dangers. When they do, it’s important that you have the right coverage to maintain your dental hygiene and health. Dental plans and dental insurance will help you keep those choppers clean, strong, and cared for without blowing your pension on dental visits. Dental savings plans and dental insurance let you pay a nominal annual fee and receive deep discounts on common and rare dental procedures in return. Typically with dental insurance, this fee is billed as an annual payment and you’ll likely have to pay a deductible when you get treatment. With dental savings plans, everything from cleaning and checkups, to root canals and bridges can be discounted as much as 60%. Dental savings plans are managed online, and there’s no deductibles, copays, or waiting periods either, making dental discount plans ideal for seniors in need of dental coverage fast. 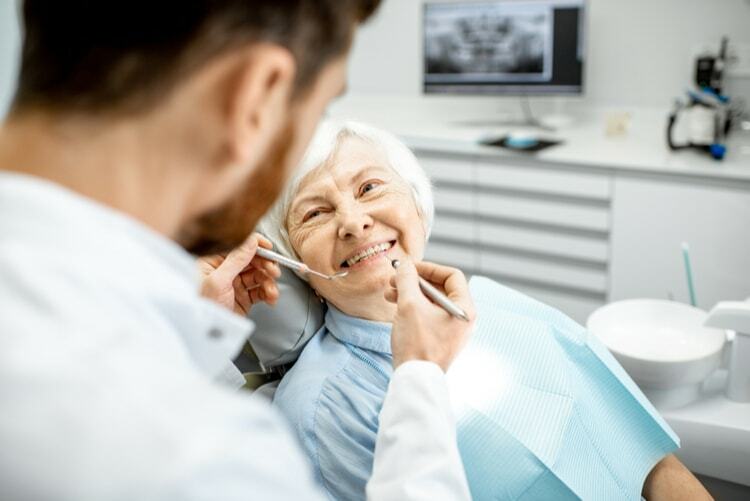 Here are 5 of the best dental plans and dental insurance providers that cater specifically to senior citizens. One of the largest health, dental, and wellness savings plans around the world, Careington has an international member base of over 15 million users. With a clientele like that, along with 40 years in the business, you can rest assured that Careington will take great care of your teeth. Careington plans cover all members of your household, and what’s really unique about this dental plan is that it can be used while you’re traveling abroad as well. That’s good news if you suddenly get a toothache while traveling. A quick visit to the dentist will be covered, and it doesn’t have to ruin your vacation. And while some providers will let you access coverage as soon as the next day, nobody beats Careington. That’s because this dental plan provider will cover your visits the SAME DAY you sign up. Now that’s service with a smile. Like several of the other providers on this list, Careington offers savings on vision care and prescriptions as well as dental procedures. But the most impressive feature for seniors offered by Careington is found in the Careington Dental, Vision Plus Telemedicine Plan. This plan allows members the ability to call a licensed doctor or nurse at any time of night or day for help and assistance with common problems such as flu symptoms, sinus infections, and earaches. The online marketplace eHealth is a reliable spot to find dental plans and dental insurance, in that it allows you to instantly compare prices and coverage from a wide range of companies. All you do is go online and punch in a couple personal details, and in a moment you can see some of your options. You can easily search and filter the results based on parameters like price, annual maximum payout, premium cost, deductible cost, monthly price, and more. This interface allows you to plug in what’s most important to you, and find the plan that’s closest to what you need. Spirit Dental and Vision takes your details and looks for dental plans across a wide range of providers. No matter which plan you select, Spirit Dental and Vision states that you are guaranteed acceptance and that you will not face any sort of waiting period for full coverage or preventive, basic, or major dental services. Every plan also comes with 3 cleanings per year and coverage for major dental procedures including dental implants, among others. With any Spirit Dental and Vision coverage plan you simply pay the monthly fee as well as a one-time $100 deductible. With some providers, the level of coverage may depend on the plan you paid for as well as if you’re in the first, second or third year of the plan. Spirit Dental and Vision isn’t a dental care provider, rather a clearinghouse that matches you with providers. Regardless, the company has responsive customer service that’s very easy to reach by way of an online chat window or toll free number. With Easy Dental Quotes you can get access to affordable dental insurance and discount dental plans in no time through an easy-to-use website. You don’t have to worry about paperwork and you can easily set up treatment with no waiting period. There also isn’t any age limit to sign up for the dental plans. Easy Dental sends you a list of possible dental services providers and lets you select the one you want. You can also opt for a plan that includes coverage for dental implants. The prices and level of coverage/discounts will depend on which plan you select and which state you live in. If you aren’t happy with your coverage, you can make use of the company’s 30-day money-back guarantee. With Denali Dental and Vision you can get coverage right away and don’t have to wait a long time for an appointment. The company includes plans that cover up to $6,000 per person each year, which is significantly higher than much of the competition. You also have the ability to choose your own dentist and aren’t locked into using providers from the company’s network. The plans can be used to cover a wide range of procedures, including those common to seniors, such as implants and dentures. On the Denali website you punch in your details and can easily search plans based on a wide range of parameters. You’ll find that the amount of coverage and the prices depend on the plan you recieve. With a number of plans, you don’t receive more than 10% coverage on major services in your first year. You’re in your golden years, don’t let a little toothache stop you from enjoying the best years yet. Get simple, affordable, and easy to activate coverage with one of the top dental savings plans for seniors, and live every minute of life to its fullest.